The gentle distractive forces of Spinal Decompression create distraction and a negative pressure within the disc space to improve blood flow and nutrient exchange to the injured area. You’ll experience several cycles of stretch and relaxation, which gradually peaks over a period of several minutes. Sessions last 20 minutes or less. Most people feel pain relief in as few as 3-5 sessions. Immediate relief typically occurs after the first session. Our Triton DTS system makes Spinal Decompression a very comfortable experience. In fact, many people drift off and nap during the session. Included during the session are: Cold Laser and Specific, Gentle Adjustments. 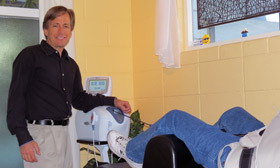 Our Redlands office has made Spinal Decompression very affordable to Redlands. Call our Redlands office for additional information.